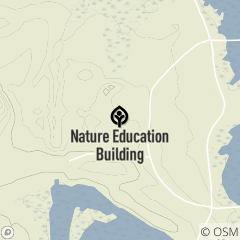 Located near North Chagrin Nature Center is the Nature Education Building. This satellite facility can be reserved by teachers as a field classroom. The facility is also open Friday, Saturday and Sunday from Noon - 4:30 p.m. to park visitors. Enjoy the wildlife observation window, where one-way glass permits up-close observation of birds with an audio system that brings the sounds of nature indoors. Step into the Forest Nightlife exhibit where nocturnal animals and night sounds surround you. Live owls offer visitors the rare opportunity to learn more about these secretive nocturnal birds of prey. Join Natalie the Naturalist to discover toads.